Pasta – a delicious side dish, they are also used as a dressing for conventional and dairy soups, cooking casseroles. But, of course, the use of this product depends on what is included in their composition. Therefore, buying pasta, vermicelli or noodles, be sure to read the information on the package. Pasta and pasta, which you can buy in Russian stores, regardless of the country in which they were produced, are divided into three classes. Class a is made only of durum wheat, called durum. For the manufacture of macaroni, class In is used the average of the hardness of wheat, and for p – soft varieties. In addition to flour from wheat corresponding hardness, the pasta dough can be added flavoring agents, preservatives, colorants (natural and synthetic), as well as eggs and their derivatives, whey and milk, whole or dry. Regarding the product such as spaghetti, their composition is nothing but water and flour, by definition, should not be. Can only use pulp from organic vegetables (carrots, pumpkins, tomatoes) for staining of the test in other colors. Spaghetti is also divided into two classes. Part spaghetti 1st grade need to sign high quality flour of hard varieties, for products of the 2nd class using flour of first grade. The most useful are the pasta and spaghetti, which only durum wheat and water, in the case of natural vegetable juice. Pasta and flour varieties "durum" - must necessarily enter into the diet of someone who wants to eat healthy. They are useful even for diabetics. Pasta of the highest grade, consisting of high-quality wheat and water is a highly concentrated source of fiber, complex carbohydrates, many minerals and vitamins. Especially great is the amount of vitamin B1. The complex of useful substances contained in pasta, helps lower "bad" cholesterol in the blood by stimulating the process of losing weight and reducing the risk of coronary heart disease. These macaroons are a necessary component of many diets, both therapeutic and those that are designed to reduce and stabilize weight. Energy value of 100 grams of pasta – 350 calories, they contain 12-14 grams of protein, 1.1 to 2 grams of fat, 70 grams of carbohydrates. Spaghetti and pasta of the highest class contain useful carbohydrates are "slow" sugars, which are fully absorbed by the body without turning into fat cells and not putting off in the form of fat reserves. They fully meet the need in the glycogen necessary for muscle and liver. In addition, pasta contains the amino acid tryptophan, which is involved in the synthesis of serotonin - the good mood stimulator. Pasta is one of the oldest products ever invented. In Ancient Egypt used to eat their prototypes - sun-dried thin strips of dough. And today they are prepared in many countries, using as a garnish or feeding to the table in separate dishes. Only those who are watching their figure, try to limit their consumption, considering the pasta a harmful product. But this is not entirely true. 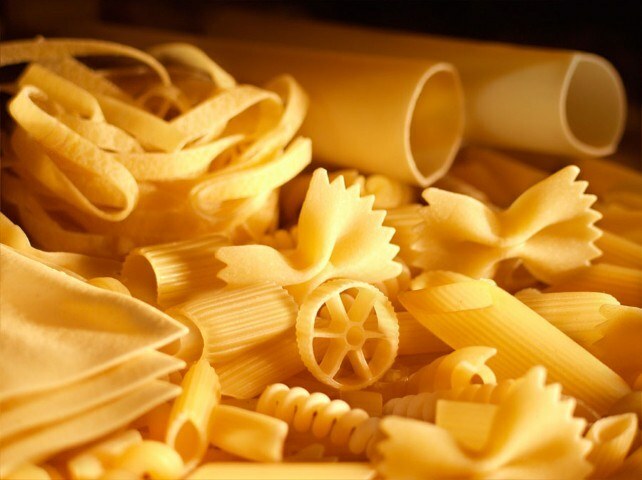 Pasta in Russia and the CIS countries called any types of solid products of flour – from spirals to shells. A native of Italy, the so-called exclusively hollow tubes. And they are made, as all the real pasta, exclusively from flour of durum wheat and water. No eggs in the pasta composition and speech can not go. Such a product can harm the body and overall health in only a few cases. First, when excessive consumption. Second, in combination with other high-calorie foods: fatty meats, baked goods, or high calorie sauces with lots of preservatives. Thirdly, improper cooking, when the pasta in boiling water kept for much longer time. In other cases, pasta from durum wheat not only bad to eat, but even useful, because the product itself does not contain many calories but rich in fiber, minerals, vitamins b and E.
Much greater harm for pasta, made from flour soft wheat varieties, as well as pasta, which, in addition to white flour, eggs. These products have high contents of simple carbohydrates that are poorly absorbed by the body. After using these pasta dramatically increases the level of glucose in the blood and the release of insulin, so the man quickly begins to feel hunger. In addition, part of simple carbohydrates is certainly deposited in the subcutaneous fat. 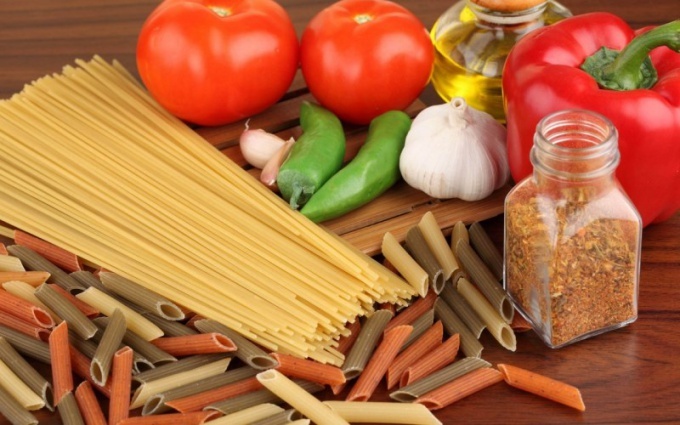 It is best to combine pasta with olive oil, vegetables and herbs – the risk to get fat on this dish is minimal. In pasta from soft wheat also has a high content of refined starch, which negatively affects the work of many organs, can disrupt hormonal balance and lead to obesity. But the nutrients and vitamins in them virtually no. That's why should abandon such products at all or reduce their consumption to a minimum. If there is no choice and have to eat these noodles, try not to digest, otherwise they will increase the level glycemia. In order not to harm the figure and health, should eat only pasta, made from flour of durum wheat. On the packs of such products will be written durum (English) or semolina di grano duro (Italian). It is also important to pay attention to the condition of the pasta – they must be smooth, without any inclusions or defects, glassy consistency. Pasta many people ostracize, considering that eating delicious spaghetti or noodle leads to the recruitment of extra pounds. 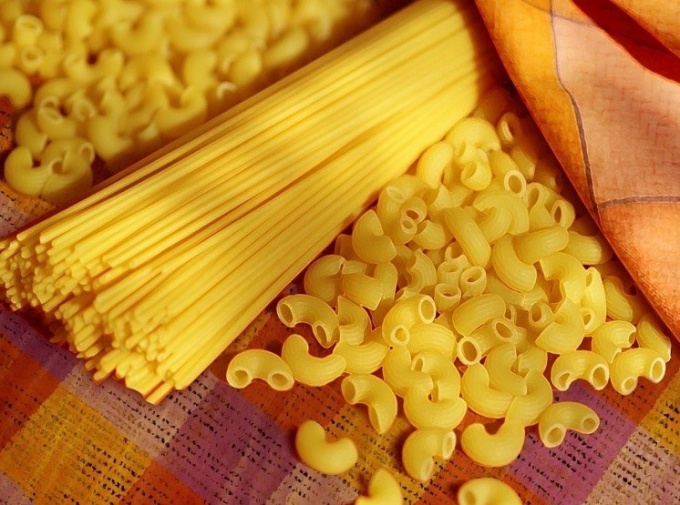 But in fact, from the macaroni do not get fat, you only need to choose the right product made of durum wheat. Pasta is one of the most common types of side dish, which is loved not only in Italy but also in Russia. Italian pasta are the most delicious and high-quality, and even pasta allows you to keep in shape. For this you need to eat it without gravy, choosing products made from durum wheat. These macaroons equivalent to dietary product. Low-calorie pasta from durum wheat is possible even in large quantities. Of course, this food does not allow you to lose weight, but to gain unnecessary pounds from these dishes will not succeed. In contrast, soft wheat pasta, which by their caloric value is not inferior to butter the bread rolls and white bread. To know that pasta made from hard wheat varieties, will help the label "Made exclusively from durum wheat". Flour from these varieties may also enter into the composition of the product in a small amount. The main difference between the two kinds of pasta lies in the condition of the starch. From durum it has a crystalline form, a soft viscous state. Pasta made from durum wheat retain maximum nutrients. Except for a small number of calories, these foods are rich in fiber, vegetable proteins, vitamin F and group B. To distinguish pasta made from durum wheat, can be visually. These products have a Golden color, in a package almost never see the powdery dust. Pasta from durum will please the buyer that when cooked they do not fall apart. Another sign useful pasta – smooth, almost polished surface. Note, of course, and on the label on the package. But beware of imitations, pasta from durum wheat is not as common as products from soft wheat. All because hard varieties have more complex processing technology. Pasta from durum is more expensive than normal pasta. As a rule, the lower the price of the product, the less used flour from durum wheat for production of spaghetti, noodles or horns. Should give preference to pasta, top class or class A, they use over 70% of the durum wheat. Don't forget that to store pasta can be no more than three years, and if it is egg noodles, it will be usable for about a year.